PDF to Word Pro by Flyingbee by Flyingbee Software Co., Ltd.
by Flyingbee Software Co., Ltd.
PDF to Word is an utility designed to convert Adobe PDF document to Microsoft Office Word files(.docx), PDF to Word can keep the original content, layout and formatting for easier editing or reusing the content, support opened in popular mobile office editor app(such as: Microsoft Office Mobile, Polaris Office, Smart Office or QuickOffice). • Initiative interface & simple workflow, easy to use. 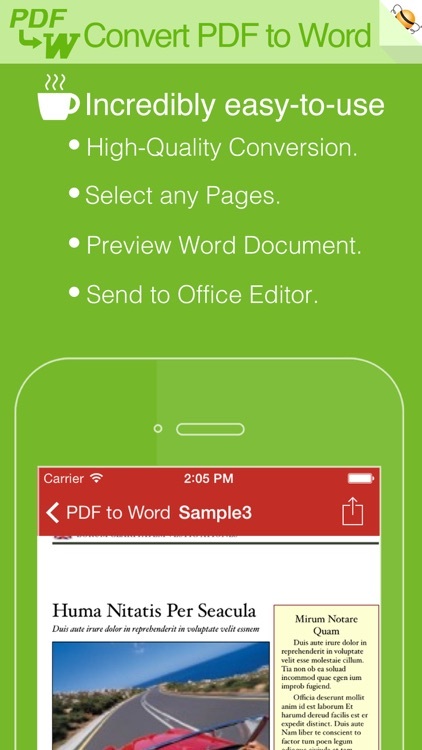 • Easily import PDF, convert a 50 pages PDF to Word within 30 secs, Extremely fast!! • Support convert PDF to Word(.docx), RTF(.rtf), Text(.txt) and HTML(.html) formats. • Conversion Process 100% on your local iOS device, No internet connection need. • Output well organized Word content, preserving content layout, the color, font style and images remain the same as the original pdf document, Very convenient tool. • Convert any particular pages (e.g. 1, 3-8, 26 or all pages) to save your time. 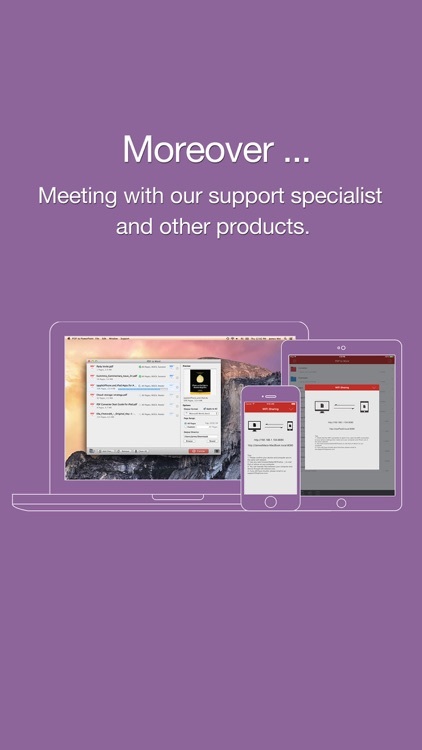 • Connect to online cloud storage support, include Cloud Me and any FTP or WebDAV Server. • Support Microsoft Office 2007, 2008, 2011 and 2016 Word Application, not completely compatible with iWork Pages. 1. Open Mail app, use "Open In.." to send source PDF file to PDF to Word. 2. 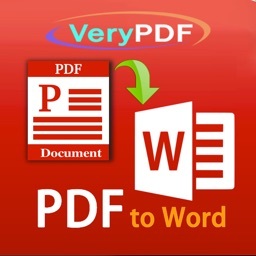 Go to PDF to Word app, touch to open the source PDF file where text come from. 3. Click "Convert" button to extract PDF to Word files. • Really attractive, super easy to use interface. 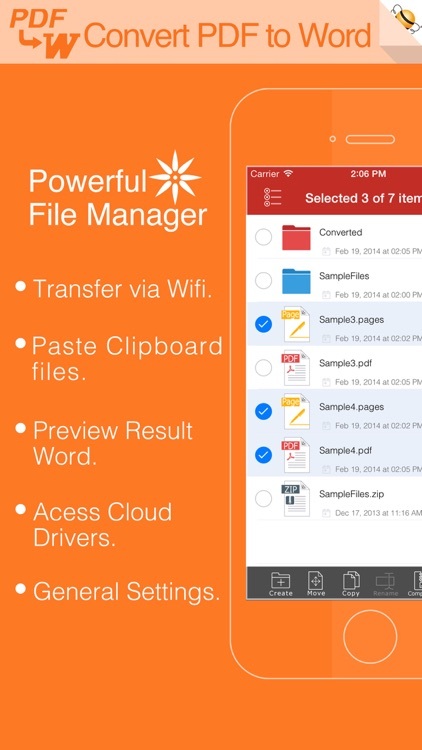 • Import PDF from Mail, Safari, PDF Reader, GoodReader, Dropbox and other apps. • Build-in Text Editor let you view and edit text files. • Mail out documents as email attachments or Send files to other apps("Open In.." integration). • Share and Compress files to .zip file. • File manager, rename, copy, move, delete and compress. • Paste file(s) from clipboard (Add files from other app). • Copy file to clipboard (Used for mail or other app). • Wifi file transfer (Use Web Browser or WebDAV clients to Upload or Download files). • USB file transfer (iTunes USB file sharing). • Print PDF or Word to AirPrint-enable printers. Notice: Currently PDF to Word version don't have OCR function, the scanned PDF files will be extracted to image in Word doc. However, we suggest you to use other professional OCR app to recognize editable text from image. Support both iPhone and iPad! Several sample files have been included, you can test it right now! 1. Why I get "Conversion Failed" error message when I extracting from a PDF file? Do you have a PDF (Adobe Acrobat) file which cannot be printed, copied, or edited? Your PDF file has had password security and other restrictions added, you need remove restrictions. 2. Why some text in PDF file can not be extracted out? The PDF file format is complex, there are cases that text in a PDF file are actually pictures. We do not grantee PDF to Word will work for every PDF file, especially ones that have picture text, we suggest you to use professional OCR app to recognize text from image. Please send us your PDF file for testing before buying our app, we will test it, and give you the result! We are continuously developing PDF to Word, so please feel free to contact us with your questions, suggestions or any problems, and we will reply ASAP.